AMMAR C1. BOULENGUEZ J2. ZENG X1. In recent years, iridescent materials have come to play an increasingly important role in the world of the industries like cosmetics, textile, automotive, etc. They belong to the goniochromic materials, that they have a variable and changing colour appearance, according to the conditions of observation or lighting. 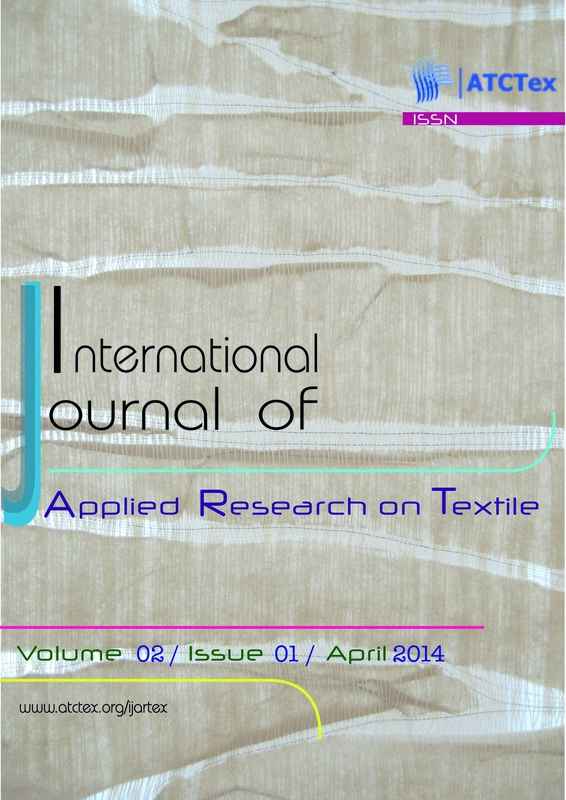 The extension of these materials and the complexity of their use and their reproduction in textile reveal new research orientations in this field. These consist in studying the origin of these colours, their optical properties, their various perceptible effects on the textiles. The aim of our work is to develop a physical protocol of characterization which identifies the iridescence textiles and reveals their particularities in regard to the ordinary textiles without appealing to the human evaluation. An instrumental analysis has allowed defining the physicals characteristic of the iridescent textiles. .
Fibre composites are getting more popular as structural materials for their stiffness, strength, and toughness in the direction of fibre longitudinal axis. Three different fibres each of 5.3, 4.6, and 3.4 GPa in strength were used in this study. They were made in different preforms to make composite materials. The tensile strength values of composites were evaluated on the basis of the fibre tensile strengths and the structure of the preforms used for the fabrication of these composites. Each fibre showed a different mathematical relation with the tensile strength of the corresponding composite material. This gives an indication that the tensile strength of the composite material is affected by that of the fibre in conjunction with the preform structure..
TRIKI A2. GUIHA M1. BENHASSEN M1. OMRI M. A2. AROUS M2. KALLEL A2. Polymer composite of an unsaturated polyester matrix with non-woven Alfa fibres hybridized with wool fibres and thermo-binder fibres (PE/PET) was characterized by different techniques in order to probe the interfacial region fibres/matrix. Dielectric measurements were performed in the frequency range 0.1 Hz - 1 MHz and temperature interval from ambient to 150�C. This study allows the analysis of the interfacial MWS relaxation using the Havrilliak Negami equation adopting the electric modulus formalism. The lowness of this relaxation intensity reveals a good adhesion of the fibres in the matrix. These results were confirmed by FT-IR technique which demonstrates the presence of hydrogen bonds between the fibres and the matrix. In addition the scanning electron microscope (SEM) observation exhibits a close contact between the fibres and the matrix. .
HALLEB A. N1. SAHNOUN M1. CHEIKHROUHOU M1. In this work, we have developed a sensory assessment method which involves experts as a measuring instrument. These experts took part in a training program. During this program, their performance on the level of repeatability was controlled to decrease the variability of the provided measurements. We have emphasized the experience acquired by these panellists with the assessment of the denim fabric samples. These samples are treated by two different finishing processes. These panellists assessed 16 attributes selected to find out the difference between the treated samples. They were able to discriminate and to quantify the difference between the assessed samples..
GHANMI H1. HAMDAOUI M2. FAYALA F2. As considered important in major treatments including dyeing and finishing processes, the measure of water transport behavior along textiles has been studied. The present work has introduced in details a novel conception of an apparatus based on electrical capacitive voice. Cotton and viscose fabrics in various forms were examined and the influence of the sort of fibers, weft count and weave structure on water transport phenomenon is discussed. The obtained results, given as a function of time, were consistent with those measured via a balance instrument. This confirms that the developed apparatus is potentially useful as a convenient evaluation of water transport phenomenon along fabrics..